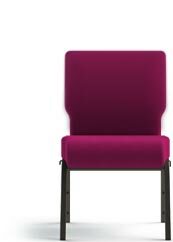 21 inch wide church chairs give your congregation the personal space they need to feel comfortable and focus on the Word. Book pouches keep bibles and hymnals within easy reach and racks under the seat hold personal belongings. 21 Inch Wide Church Chairs with Book Pouches and Racks, Custom Upholstery and Embroidery.